PRO SE PRODUCTIONS RELEASES SECOND SILVER MANTICORE VOLUME! A popular New Pulp character makes his return to print today from Pro Se Productions and he’s not alone! The Silver Manticore- To some, he is nothing more than an urban legend, rising from the fears of cowardly criminals. To others, he is a masked mastermind of evil cutting into the biggest schemes, helping himself to the largest share. And then there’s the truth-that the Manticore, unknown to both the Law and The Underworld, is a force of good merely posing as a crook! THE SILVER MANTICORE: FRIENDS AND FOES by PJ Lozito is a collection of stories focusing on the heroes and villains, the sidekicks and henchmen that surround the mysterious masked crimefighter known as The Silver Manticore. 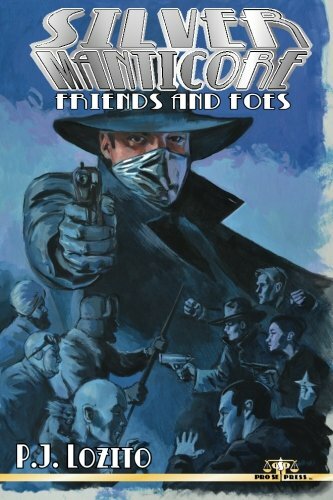 The cover, wonderfully rendered by Pro Se Artist Adam Shaw with logo design by Perry Constantine, is reminiscent of the best classic Pulp covers. It features not only the Manticore himself prominently, but members of the legions of good and evil ready to fight one another for or against the masked man. Regardless of what those who know of the mysterious figure believe, The Silver Manticore has come into contact and conflict with allies and enemies. This avenging vigilante has definitely made many friends and foes, each with their own stories! Pro Se Productions proudly presents SILVER MANTICORE: FRIENDS AND FOES by PJ Lozito. The follow up to the Pro Se Bestseller, THE STING OF THE SILVER MANTICORE, this volume presents a side of the Pulp hero that often goes unseen- How Those who stand beside and against what he does view him and his actions. The Maggot, who has used the very same methods of the Manticore in his own war on crime, Doc Wylie, scientist and crime buster supreme, who has been pressed into aiding the Silver Manticore, Special Inspector Joe Casey of the N.Y.P.D., who secretly works for the Silver Manticore, Evan White, the African American who inherited the silver mask in the 1950s and many others who have come to know The Manticore for better or worse. Fight alongside PJ Lozito’s fantastic homage to classic heroes and those he encounters in SILVER MANTICORE: FRIENDS AND FOES from Pro Se Productions. FOUR NEW SINGLE SHOT STORIES DEBUT FROM PRO SE FOR 99 CENTS EACH!